﻿ Used Harley Davidson Parts. Salvage Harley Motorcycles. Harley Davidson Salvage. 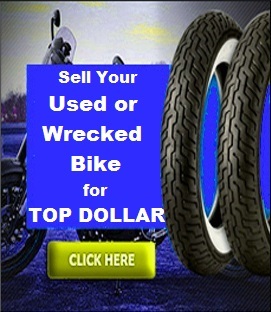 motorcycle, atv parts, utv, dirtbike, or pwc parts. We carry vintage to current year models and offer all makes including Yamaha, Honda, Kawasaki, Suzuki, Polaris, Harley Davidson, Buell, BMW, Victory and many more. Call 1-800-428-7821 or submit the form above. Used Harley Parts. Salvage Harley Motorcycles. 99 harley road king classic 1450 Lower saddlebag clip. Plastic clip on saddlebag is broke, upper clip is fine. 05 harley flhtp twin cam 88 Front seat mount brackets for police seat. Brackets are fastened to the frame near the gas tank. 88 harley fxr 1340 have a really good looking lowered an stretched Fxr. It has a new rebuilt motor on it with not even 3000 miles yet. Bunch of extras inside motor. I have just tore up trans in it though and not sure how much more $$ I wanna dump in it. I have 8,000 in it now and would prob take 5,000 or best offer. Let me know if u would be interested in pics or Makin an offer. 11 hd softail deluxe need a sissy bar and bags. 08 hd road king police all the hardware from a set of fiberglass saddlebags to convert the police style (hockey puck knob) to the standard style. All of the holes are alreaady there but plugges so I am confident it is an easy changeover with the proper hardware. 99 harley fxstc need motor and trans and final drive all need to be chrome. motor if i can get s&s if not other manf fine. on trans would like baker if not other manf are fine. trans does need to be 5 or 6 speed. 04 harley flh harley frame any condition. I need the neck so I can order a new fram from harley. 03 harley sportster 1200 sissy bar for my Harley, do you have any? 99-07 hayabusa 1300 Want to check pricing of a clean, or salvage frame for Busa. 98 hd fxdwg 1340 80 ci looking for screaming eagle cylinder heads. or a good pair of stock heads I can port & polish. 81 harley fltc tour glide classic 1340cc : motor & ss carb, exhaust pipes+ clamps and brackets. 94 hd heritage softail nostalgia fln 80ci : Rear polydrive belt 14mm 1-1/2"
79 hd fx : looking fo electric starter and inner & outer primary covers plus an ignition. 76 hd xl Wanting to know if you have any parts for a 76 iron head sporster? 89 harley sportster 883 I'm looking for part# 40271-89. On the flip-side it has 15C95. This is a front pulley from an aftermarket chain to belt conversion kit. It has 27 teeth and 19 splines for the shaft. 89 harley sportster 883 I'm looking for part# 40271-89. On the flip-side it has 15C95. This is a front pulley from an aftermarket chain to belt conversion kit. It has 27 teeth and 19 splines for the shaft. Please let me know if you can help me. Thanks! 97 harley sportster sport 1200 LOOKING FOR THE DUAL GAUGE PACK. IT HOLDS THE SPEEDO AND TAC. 08 harley electra glide ultra classic I need the 105th Anniversary color parts as follows: outer fairing, LH & RH Lowers, F & R Fender, L & R Suite cases (Saddle Bags), Tour Pack. 10 hd electra glide ultra classic frame that has a clear title. 1981 Harley-Davidson XLS 1000 Roadster Clutch Lever Assy. 89 harley heritage softail classic complete floorboard set, both sides, to include R brake cylinder, shifter assm, mounting brackets, etc. 2000 hd fat boy 1340 complete frame including front forks & rear swingarm. 04 hd fxdl I 1425 Complete set of mid controls including brake / transmission linkage. 91 harley flhtc 1340 volume control switch for 1991 flhtc or help on locating one. 02 hd fxsti hd FLSTC Detach Windsheild w/s kit - 2"
92 hd flhtcu good used engine or at the least an engine that is rebuildable. Also a fairing radio/stero that will fit my bike. 2015 Harley-Davidson Dyna Street Bob Exhaust System Vance and Hines 2 - 2 radius black or Chrome. 02 hd road king classic fairing (batwing and hard fiberglass bags. 03 buell firebolt xb9r Im looking for a chin fairing and mounting brackets? 07 buell firebolt xb9r 984cc Need (1) front exhaust mount. I have the strap, bolt & bushings. I need the mount only. 08 hd fxst Rear Fender Harness #68819-06.,Pse provide shipping costs with item cost. 05 hd electra glide ultra I am wanting to change the radio from a Classic to a Ultra Radio with intercom. I have allready added the cable with intercom plugs from the tank to the passanger, I will need to change the radio and add the cable to the radioplug.